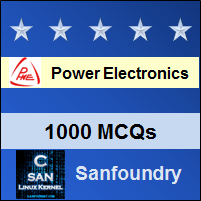 This set of Power Electronics Multiple Choice Questions & Answers (MCQs) focuses on “Three-Phase Rectifiers-2”. 1. A step-down delta-star transformer, with per-phase turns ratio of 5 is fed from a 3-phase 1100 V, 50 Hz source. The secondary of this transformer is connected through a 3-pulse type rectifier, which is feeding feeding an R load. Find the average value of output voltage. Vo = 3√3/2π x Vmp = (√2 x √3 x 3 x 220)/(2 x π). Explanation: A 3-phase, 6-pulse rectifier consists of 6 diodes connected in 3 legs. Two diodes conduct at a time. 3. A step-down delta-star transformer, with per-phase turns ratio of 5 is fed from a 3-phase 1100 V source. The secondary of this transformer is connected through a 3-pulse type rectifier, which is feeding an R load. The power delivered to the load is 6839.3 Watts. The maximum value of the load current is √2 x 22 A. Put R in equation (i) & find the required R.M.S voltage. 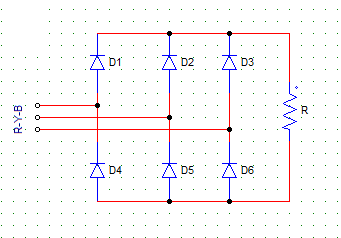 Explanation: Which diode will conduct depends on where is it in connected? as in in which phase?. D3’s anode is connected to the R phase, hence it will turn on when R is the most positive. Explanation: Construct the phase voltage waveforms on a graph. At 150 degree, D2 is forward biased while the other positive group diodes i.e. D2 and D3 remain reserved biased. Explanation: The conduction sequence always depends on the phase sequence, which diode is conducting will depend upon which phase voltage is active at that moment. Explanation: Two diodes conduct at a time, constructing the equivalent circuit with supply, R & replacing the conducting diodes by S.C & non-conducting as O.C, the required value can be found out. Vml = (π x Vo)/3 = 300 V.
9. A 3-phase bridge rectifier charges a 240 V battery. The rectifier is given a 3-phase, 230 V supply. The current limiting resistance in series with the battery is of 8 Ω. Find the average value of battery charging current. Io = (Vo – E)/R = (310.56 – 240)/8. 10. A 3-phase bridge rectifier charges a 240-V battery. The rectifier is given a 3-phase 230 V supply. The current limiting resistance in series with the battery is 8 Ω. Find the power delivered to the battery (Pdc). Pdc = 240 x 8.82 = 2116 W.